SimpliSafe prides itself on being one of the easiest home security systems to install and manage. All equipment comes pre-programmed, so all you have to do is plug them in and you can expect to have a fully functioning system. They also give you the option to choose to have professional monitoring, or you can just keep your system local and manage it on your own. With no contract, you can also opt in or out of monitoring with no cancellation fee. One of the most appealing things about SimpliSafe is the lack of a contract. You aren’t tied into a long-term commitment. So if you don’t like the system, you can move on without the fear of a looming, often hefty, fee for canceling your service. They also make building a quality home security system easy. On the downside their devices, while acceptable, look a little outdated when compared to some of the newer offerings from companies like Canary and Piper. And speaking of Canary and Piper, that is another thing that you may want to consider when it comes to SimpliSafe. 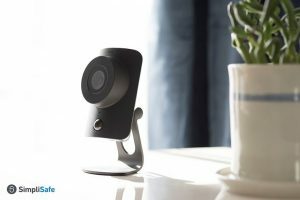 While they have added a camera to the mix, it’s not as advanced as some of the other smart home security cameras on the market. They are also behind when it comes to how they play with other devices; their inability to connect with Z-Wave or ZigBee restricts users who want to create a robust home automation system. SimpliSafe Security is among our 2017 picks as one of the most reliable and user-friendly systems you can get. While this isn’t the type of security system typically installed by a professional, it still is among this new generation of systems that are extremely easy to set up (others you may want to check out include Frontpoint, Protect America and Link Interactive). This system allows access to home security quickly and effortlessly. Another quality of this security system is that it doesn’t require a contract, which means that you have no obligation to continue using the system if you are dissatisfied or find another system to use. SimpliSafe has grown from a small security business to a large-scale operation where users can take advantage of full scale monitoring package. With the numerous complex features of this security system, you will be able to attain the full and high-quality monitoring to protect your family and your home. Before settling on a home security system, it’s always recommended to cover the advantages and disadvantage of the system. By covering the qualities that make the system worthwhile and less so, you will be able to make an informed decision as to whether the system works best for you. When it comes to the SimpliSafe, there are many commendable qualities. When reviewing the advantages and disadvantages, it is easy to see that main benefit of SimpliSafe rests in the system’s promising qualities as a DIY system. With SimpliSafe, users can purchase the system, get it up and running, and manage it without any complications. It is also evident that SimpliSafe is confident in its security capabilities and features, as it also provides users with a money-back guarantee in case they are displeased. In addition, while the drawbacks arise out of the system’s inability to provide some advanced features like camera monitoring and a technological mobile application, the system seems to make up for it through its customization features. The first thing you should expect is that it’s not pretty. It’s not sleek or modern, but like dating someone with a great personality, over time it will start to look better, and it is always easy to be around. The base station is a plastic cone-shaped device with a blue light that will let you know the base is arming the alarm. If the light is blinking it is telling you that one of your sensors needs attention due to an error. Setting up the base station is simple, you just need to place it in a location that is within 400 feet of your sensors and within 100 feet of the keypad. You will also need a power outlet to plug in your power cord. You don’t need to connect it to a WiFi router, which makes it easier to place within range of the sensors and the keypad. It also comes with a SIM card to allow it to use a cellular option to monitor the system. One of the benefits of using cellular is that it has a constant connection. So if someone cuts your power lines, the cellular connection won’t be interrupted. Keypads and sensors run on lithium batteries that have a lifespan of up to five years. Should you find yourself with a dead battery, the system will send you an alert. When it comes to placing the sensors its pretty easy, you just peel the back and place them where you want them to go. The nice thing is that the backing will hold the sensor in place, but when you need to move it they won’t leave any sticky residue behind. They are also easy to remove and place somewhere else, which makes it nice if you need to move. If you plan on living in your house forever, you can also use the screws provided with the kit permanently place the sensors. You should be able to be up and running in less than an hour, even if you aren’t handy. 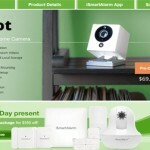 All of the devices and sensors are covered by a 60-day return policy and a money back guarantee. The hardware is also protected by a three-year warranty. This is how easy it is to install SimpliSafe. Typically, this section covers a comparison between a security system’s packages. One of the unique qualities of this particular system is that it doesn’t include separate packages. Those who are interested in the system simply purchase the standard package and any additional security add-ons that they would like. Taking this into consideration, let’s cover what the packages include and what you can add onto the system if you need additional security tools. With five different packages available it is easy to find a solution that can provide you with the level of home security you are looking for unless you are building an underground highly secure bunker. But for those of us who live above ground, they have some comprehensive plans that will keep our homes and families safe. Packages range in price from $229.96 to $539.85 which means they most likely aren’t the most inexpensive option. But they do offer some additional features like wireless connections that will keep your system operational should the power go out by using a backup cellular option that doesn’t rely on power or WiFi. 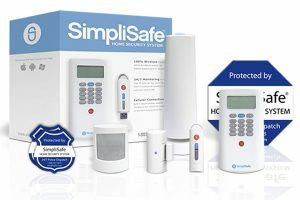 These are the current equipment packages that SimpliSafe offers. In addition to purchasing your equipment, you will find yourself paying $19.99 monthly to have your SMS and email alerts sent to you. You can also tag on an additional $5.oo if you want to manage your system from your smartphone, which brings the total to $24.99. If you only want cellular back-up and live monitoring you will just pay $14.99 monthly fee. But this fee is worth it, the system can function locally without the live monitoring and cellular backup, but it’s better to have the added protection. Before testing the system it seemed a little pricey and we had our concerns about how it would compare to other similar options that did not have added fees. But the ease of the setup process and the fact that everything worked on the first go around made us see SimpliSafe in a new light. The other thing that we love is you can try it, and if you don’t like it you can just return it. No questions asked, no hassle, no cancellation fees. From start to finish SimpliSafe makes the process, well, simple. And if you don’t like the packages, no worries, you can build your own. You can even add their recent beta released security camera. You can also purchase items separately even if they aren’t part of your package. If you have more windows than sensors, you can buy additional entry sensors. Here is a breakdown of all of the devices you can buy and their prices. The base station is the heart of your home security system. Upon detection of a threat, the base station sends a signal to the monitoring center. In addition to sending a notice to the monitoring center that operates 24/7, the station also sends a message to your mobile phone. To ensure that you receive notifications from the monitoring service, you will need to activate the SIM card by subscribing to the alarm service. While a keypad doesn’t seem like a unique feature, there is something special about SimpliSafe’s keypad. Unlike other keypads, this particular one will continue to function, even if an intruder smashes it. The computer in the keypad is linked directly to the base station. As a result, you will still get the ongoing protection that you need. Another point to note is that the keypad itself is a pretty secure device. The strength and durability of the keypad and other monitoring tools mean that you will need to worry less about replacing the devices. SimpliSafe’s monitoring system functions largely on the operation of the system’s motion sensors. Each motion sensor can detect movement from within 30 feet. Moreover, the sensors have a “field of vision” of 90 degrees, which means that you are going to get the most coverage by placing the sensor in a corner. If you need additional sensors, you will need to purchase them separately. Every SimpliSafe package also comes with four entry sensors. These sensors are meant to be placed at your home’s entryways such as doors and windows. Each sensor has a magnet attached to it and once the magnet detaches from the window or door, the sensor activates and notifies the monitoring sensors and your mobile device. The best quality about these entry way sensors is that they are designed to accommodate nearly all types of windows and doors. Magnets can be placed as far as two inches away from the sensor. The keychain remote makes arming and disarming the system simple. All you need to do is push the button. The keychain remote also includes a panic button in case of an emergency. Upon pressing the panic button, the monitoring center will be notified of the emergency and will then dispatch emergency services to your home. In addition to the keychain, you will also get two window decals that you can place on your property to deter intruders. It is recommended that these decals be placed in your yard or on your window. Once you have your system set up, and you have a solid blue light to let you know its armed, you are good to go. If a sensor is triggered you will hear a beep from the keypad. From the time you hear the beep, you have 30 seconds to enter your PIN. If you don’t enter your PIN the siren in the base station will be activated and a notification will be sent to SimpliSafe. Once they have been notified they will call you and ask you for a safe word. If you don’t answer their call, or you give them the wrong safe word they will contact law enforcement and the fire department (if a CO sensor or smoke detector triggers an alarm). So if you fumble entering your PIN, or like me turn the volume way up on your earbuds and you can’t hear the alarm, you can have a chance to let them know you are safe, and just a little forgetful. You can also set the system to delay the alarm (so you don’t scare your cat) for up to 250 seconds, to let you find your remote keychain or remember where you wrote your PIN down. Nothing is worse than telling the police officer that there is no emergency just a person who lost their PIN number. 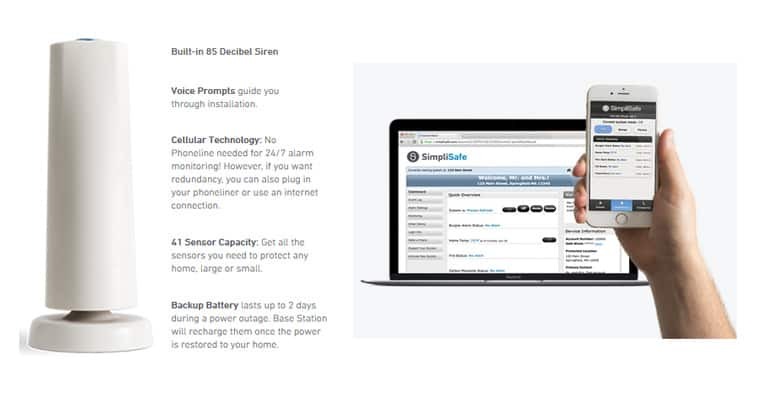 When you choose the monthly Interactive Plan with SimpliSafe you will get access to their dashboard. This lets you control your home security system, view your event log, change your PIN and add guest PINs, you can also arm and disarm the system. You can also set a Duress Pin that allows you to enter a PIN that alerts the monitoring system that you need help. You can also see the status of, and manage, your sensors. You can remove and add new devices and adjust the settings of your current devices. The dashboard is well designed and easy to use as is the mobile app. You can use the iOS, Andriod or Windows app to manage your SimpliSafe system when you are away from home or cannot access your laptop. However, using the app limits some of the functions you can perform on the dashboard. So if you need to make major changes to your system you will need to log into the online app. I am not sure why the app is so limited in its functionality, but hopefully, new versions will add new capabilities in the near future. For the meantime, this tutorial can help you get started using both the web interface and the apps. While it is easy to think that you can manage your own security, it can be tough when you are on vacation or away on business. 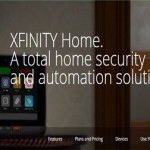 SimpliSafe has two plans to choose from when it come to monitoring your home security system. Standard: This plan provides monitoring 24 hours a day 7 days a week with a cellular connection that links to emergency services. You can also choose to not use a plan, you can get alerts through the smartphone app, but you will need to have it with you 24/7 when you are away. If you start with self-monitoring and then decide to choose professional you can easily call and have it added. *Secret Alerts allow you to know when someone has accessed safes, cabinets, file cabinets and other devices that you want to restrict access to. 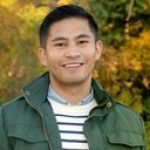 What are SimpliSafe’s Customers Saying? For the most part, SimpliSafe’s customers have been giving the system rave reviews. Most have truly appreciated the system’s ease of use and simple setup. While there are a few complaints, they aren’t ones to be too concerned about. While the above advantages are certainly indicative of how simple and comprehensive this system is, keep in mind that for optimal results, many of the current users recommend analyzing where to place the security system. Many of the following disadvantages arise because users mindlessly place the security system’s devices around the home. Therefore, keep in mind to assess where your main movement points are, which rooms require coverage, and where you should place the sensors for the best results. By doing this, you will find that the system operates very well. Overall, the main contentions with this security service revolve around problems with the technical support and monitoring center. Most users are unhappy with the wait time and the quality of responses. If you believe that you will need to contact the support center on a regular basis, then you may want to opt for a different security system. Another significant problem that was common among customers is the monitors monitor “too well.” Most users experience faulty detection resulting from pets, as well as heating and cooling systems. Again though, these issues may arise out of placing the system in the wrong area. Therefore, to minimize your chance of issues with this system, it is best to be strategic in where you place the security system. Before choosing a monitoring system, it can be helpful to determine what sets one particular system apart from another. In terms of SimpliSafe, there are a few identifying features that make this system worth buying. First and foremost, not every security system operates well during a power outage. SimpliSafe is not connected to a landline and it isn’t wired to the electricity. As a result, the system operates even during an outage, which means that you are getting the consistent connection that you need to keep your family safe. There is nothing more inconvenient than having to purchase a new security system or dealing with wires during a move. Fortunately, this security system is not only easy to install, but it is also ease to move and set up in your new home. After you remove the system from your current home, all you need to do is to set it up at your new location and to check in with the call center to verify that you are connected to the network. Finally, the system also comes with smoke and fire detection. Once the CO sensors notice a threat, they will contact the monitoring sensors and also send a message to your mobile device. 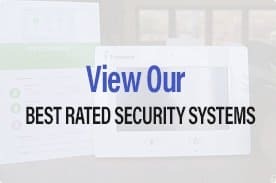 With this system, you are not only buying a system that protects you from burglars, but also one that prevents home disasters from taking place. Finally, the most unique feature of this system is that it includes a built-in cellular tower that is owned by the company. As a result, response time and emergency services are much faster than most other security systems. In addition, the independent tower also means that you won’t encounter random interruptions or other issues. A final point to note with this security system is that it does include monitoring packages. For the system to work properly, you will need to subscribe to a monthly monitoring package. The monitoring package gives you access to the security center, which is notified when a threat is detected. Once a threat is detected, the monitoring center will also contact emergency services on your behalf so that you get the help that you need. To begin with, users have the ability to choose between two plan types. The base plan costs $14.99 a month and it is recommended if you are only looking for emergency contact support. With this plan, the monitoring center will contact emergency service when needed. On the other hand, if you are looking for more serious help, then you may want to opt for the alternative plan, which costs $24.99 a month. With the $24.99 a month plan, you will get the basic level of service described above. In addition, you will also receive alters to your mobile device and email alerts if you register your email. The upgraded plan also comes with the capability to disarm and arm your system from a mobile application interface that you can download to your phone. Finally, you can also check the status of your home. The interface will notify you if there is smoke, carbon monoxide, or flooding. While these monitoring packages do offer you basic support, there is another expected upgrade that is coming early in 2016. SimpliSafe managers have hinted that the system is poised to come out with its own camera monitoring capabilities. While it is currently unknown as to whether the camera is compatible with technology that you may have or if you will need to purchase the system’s own technology, the camera system is a welcome upgrade among many. With camera monitoring, you can get better insight into your home while you aren’t there and you can ensure that everything is safe and secure. Monitoring specialists guard your home around-the-clock from our award-winning monitoring centers. In an emergency, we send the police to your home. Free cellular connection built-in. Standard + advanced mobile app control of your system from anywhere in the world. Get text + email alerts, monitor home activity, arm/disarm your system, control settings right on your smartphone or laptop. Bonus: Secret! Alerts—get secretly notified when anyone accesses private rooms, drawers, safes and more. SimpliSafe does everything it says it will do. It is easy to set up, and once everything is connected it is also easy to manage. While none of the packages currently include the beta version of their camera, you can buy it on the site if you want to add a camera to any of the packages. What SimpliSafe does is provide a workable home security system that can keep you and your home safe. The cellular connection makes it a very reliable system, you can be assured that even if someone cuts your power lines you can still connect to the monitoring center and law enforcement. The start-up cost can be a bit pricey depending on the package, and you can end up paying $24.99 a month for monitoring and SMS/email alerts. If you are looking for a less expensive system there are a few options you can choose from, iSmartAlarm has systems that cost less and have no monthly fee. Or if you want full home automation or systems that have stronger security cameras you can also look at options like SmartThings, Piper NV and Canary, all have home security cameras that have added features. SmartThings also provides a hub for setting up home automation devices. Having spent some quality time with SimpliSafe it is a solid home security system that you can rely on. It’s not the prettiest girl at the dance, but what it does it does very well. If you want something that is easy to set up, manage and move should you need to, SimpliSafe is a safe bet. Simple and easy to install allowing quick access to home security without annual contracts. Also offers professional monitoring which is optional and allows you to chose between standard or interactive monitoring. No camera monitoring and no advance features regarding the mobile interface.